The second part of a Game Center tutorial series that shows you how to create a simple multiplayer iPhone game. Create a simple multiplayer game with Game Center and Cocos2D! This is the second part of a two part Game Center tutorial series on creating a simple networked game with Game Center matchmaking. In the first part of the Game Center tutorial series, you learned how to enable Game Center for your app and find matches with other players using the built-in GKMatchmakerViewController. In this second and final part of the Game Center tutorial series, you’ll learn how to look up player aliases, how to send and receive data between games, and how to support invites. In the end, you’ll have a fully functional (but simple) networked game that uses Cocos2D and Game Center that you can play with your friends! If you haven’t got it already, start by downloading the sample project where we left it off in the last Game Center tutorial. Before we pick things back up, let’s talk about the strategy we’re going to take with our network code, starting with how to pick players. 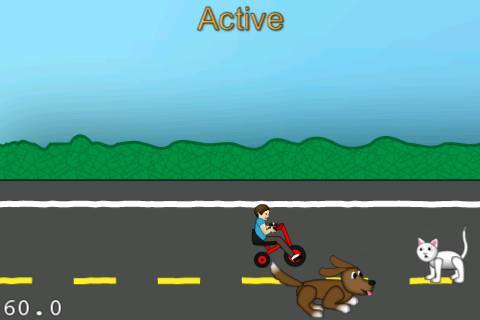 We have two players in this game: player 1 (the dog) and player 2 (the kid). The problem is, how do we decide who should be the dog and which the kid? The strategy we’re going to take is each side will generate a random number on startup, and send it to the other side. Whichever side has the larger random number will be player 1, and the other side will be player 2. In the rare event each side generates the same random number, we’ll just try again. Whichever player is player 1 will get some special “privileges.” First, that side signals the game should start by sending a message to the other side. That side also is the one who is responsible for checking when the game ends, and sending a message to the other side when the game is over (and who won). In other words, “player 1” takes the role of the “server”. He’s the final authority on what goes on for this game. Since it’s random which player is the dog and which is the kid, we need to have some way of showing the player which one he is. For this game, we’ll just print the player’s alias right on top of the character they are, so they can tell who they are. If you don’t know what a player alias is, it’s the nickname that you set up for your account in Game Center. When a match is made, you don’t get these automatically – you have to call a method so Game Center will send them to you. One of the challenges with making networked code is that things can happen in different orders than you might expect. For example, one side may finish initializing the match and send the random number to the other side before the other side even finishes initializing the match! So if we’re not careful, we can get into strange timing issues in our code that causes problems. One good way to keep things clean is to keep careful track of what state each side of the game is currently in. Waiting for Match: The game is waiting for a match to be connected, and for the player aliases to be looked up. When both of these are complete, it checks to see if it’s received the random number from the other side yet, and advances to the next state appropriately. 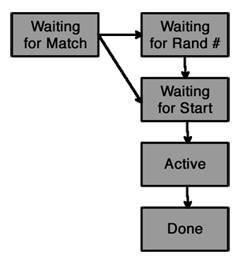 Waiting for Random #: The game has a match and has the player aliases, but is still waiting to receive a random number from the other side. Waiting for Start: The game is waiting for the other side to start the game (this occurs when the game is player 2). Active: The game is currently playing – no winner has been found yet. Every time a player moves, they will tell the other side that they’ve moved by sending a message. Done: The game is over (player 1 has sent a message to player 2 to tell him that the game is over). No more messages are sent and the playre can then restart the game. OK now that you have a plan in mind, let’s move onto the first step, which is retrieving the player aliases! This defines an instance variable and a property for a dictionary that will allow easy lookup of GKPlayer data (which includes the player’s alias) based on a player’s unique ID. Game Center will return a GKPlayer object for each player in the match as a result. To make things easier to access later, this code puts each GKPlayer object in a dictionary, keyed by player ID. Finally, it marks the match as started and calls the game’s delegate so it can start the game. CatRace[16918:207] Authentication changed: player authenticated. CatRace[16918:207] Ready to start match! You have the match set up and the player names available, so now you’re on to the real meat of the project – adding the network code! Note that each message starts with a message type – this is so that you have a known number you can look at for each message to identify what type of message it is. These will keep track of the random number for this device, whether we’re received the random number from the other side, and the other player’s player ID. So when the match starts up, we check to see whether we’ve already received the random number (which can happen due to timing), and set the state appropriately. Then it calls methods (which you’re about to write) to send the random number and maybe start the game. sendRandomNumber creates a new MessageRandomNumber structure, and sets the random number to a random number that was generated in init. It then converts the structure into an NSData to send to the other side. sendData calls the sendDataToAllPlayers method in the GCHelper’s match object to send the packet to the other side. This is quite simiple – if it’s player 1 (who has the special privilege of acting like the “server”) and the game is ready to go, it sets the game to active, and tells the other side to do the same by sending a MessageGameBegin to the other side. This method casts the incoming data as a Message structure (which always works, because we’ve set up each structure to begin with a Message structure). It can then look at the message type to see which type of message it actually is. For the MessageRandomNumber case, it checks to see if it’s player 1 or player 2 based on the random number, and advances to the next state if it was waiting for the random number (and also possibly starts the game up if it’s player 1). For the MessageGameBegin case, it just switches the game to active, since this means that player 1 has just sent a begin message to player 2. For the MessageMove case, it moves the other player forward a bit. For the MessageGameOver case, it ends the scene based on the appropriate reason. The above code is pretty simple (and commented to tell you what it does) so we won’t dwell on it further here. Phew! That was a lot of code, but the good news is it’s DONE! 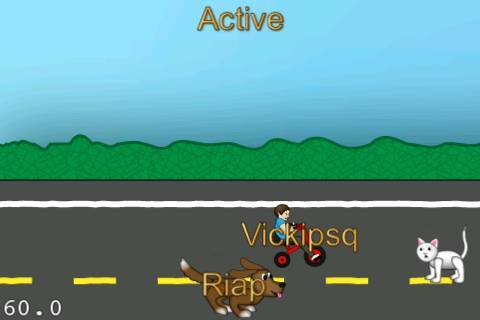 Compile and run your code on two devices, and you should be able to have a complete race! At this point you have a functional game, but it’s kinda hard to tell which player you are, especially since it’s random. This creates two CCLabelBMFonts, one for each character. To get the alias for the local player, it can get it by using the GKLocalPlayer singleton. For the other player, it has to look up the GKPlayer object from the GCHelper’s dictionary first. Basically when the game is transtioning to the Active state, we know for sure we’ve received the player names and the game is starting, so that’s a good time to set up the labels. In the update method, each frame it updates the position of the label to the corresponding player’s position. You might think that’s a bit weird – why not simply add the labels as a child of the sprite instead? Well we can’t do this because the sprites are children of a batch node (hence they can only have other sprites from the same sprite sheet as children). So this is an alternative. Compile and run your code on two devices, and now you should see the label of each player’s name on top of their character! We have a fully functional game, but let’s put in one more feature for fun and coolness – supporting invites. You may have noticed when the matchmaker view controller appears, it gives you an option to invite a friend. Right now this wouldn’t work because we haven’t added the code for it yet, but it’s pretty simple so let’s put it in there. This creates instance variables and properties to keep track of some invite information you’ll see in a bit. It also adds a new method to the GCHelperDelegate to tell it when an invite is received. 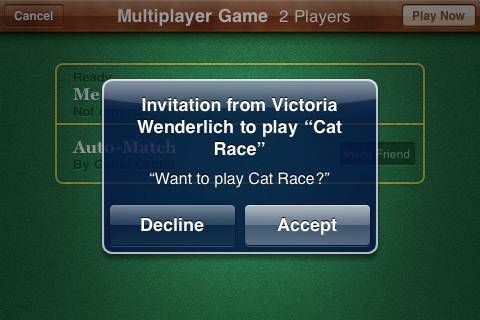 The way invites work in Game Center is that you have to register a callback block to be called when an invite is received. You should register this block as soon as possible after your game starts up – the recommended time is right after a user is authenticated. For this game, the callback squirrels away the invite info, then notifies the delegate. The delegate will then restart the Cocos2D scene and try to find a match by calling the findMatchWithMinPlayers method – we’ll modify this to take into account any pending invite info. It’s quite similar to last time, except it uses the pendingInvite and pendingPlayersToInvite values if they exist, when creating the GKMatchmakerViewController. 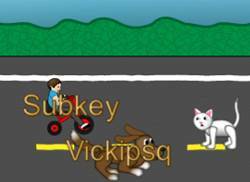 Here is a sample project with the completed Cocos2D and Game Center multiplayer networked game we created in this Game Center tutorial series. If you’re implementing Game Center in your games, you might want to add Leaderboards and Achievements too. If you’re interested in learning about this, check out the chapter on Game Center in Rod’s and my upcoming Cocos2D book! If there’s something else about Game Center you’re interested in learning about (such as voice chat, or server-hosted games so you can implement MMOs and the like), please feel free to suggest a tutorial! Also, don’t forget to vote for what tutorial you’d like to see next in the sidebar. If you have any questions, comments, or tips for using Game Center that you’ve learned while making your apps, please join in the forum discussion below!